Jackson County is located in the southeastern corner of Ohio in the Appalachian foothills. As of 2010, the county’s population was 33,225. Our county seat is Jackson and is named for Andrew Jackson, a hero of the War of 1812 who was subsequently elected President of the United States. According to the U.S. Census Bureau, the county has a total area of 422 square miles. 420 square miles is land and 2 square miles is water. Cities include Jackson and Wellston. Our villages are Coalton and Oak Hill. Unincorporated communities include Byer, Ray and Glenroy. 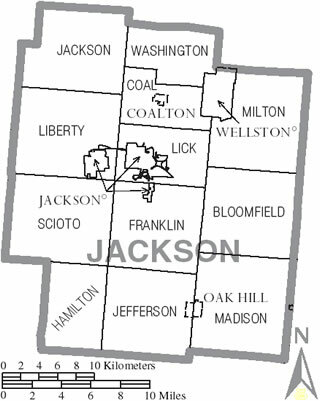 Our county contains the following townships: Bloomfield, Coal, Franklin, Hamilton, Jackson, Jefferson, Liberty, Lick, Madison, Milton, Scioto, and Washington. Jackson County is served by three public school districts: Jackson City, Wellston City, and Oak Hill-Union Local Schools. Private schools include Sts. Peter & Paul (Catholic) School and Christian Life Academy. The University of Rio Grande is located in neighboring Gallia County with branch campuses in Jackson, Pomeroy and McArthur, Ohio University offers campuses in Chillicothe, Ironton and Athens, Hocking College is located in Nelsonville, and Shawnee State University is based in Portsmouth. Buckeye Hills Career Center offers technical job training and education for both high school and adult students in nearby Rio Grande. This website is designed as an information portal to county government services, as well as other government and private resources available in Jackson County.